If you're not already a lover of fantasy and fairytale-like settings that can make you dream of little mystical critters when you drift off to sleep, then Forest Mania will definitely make you have a change of heart. You have nothing to fear once you start playing this game, there are no scary monsters that lurk behind the reels which can make you jump out of your seat. In fact, the game is so friendly, the paytable shows you the value of each symbol that will appear once the spin ends. 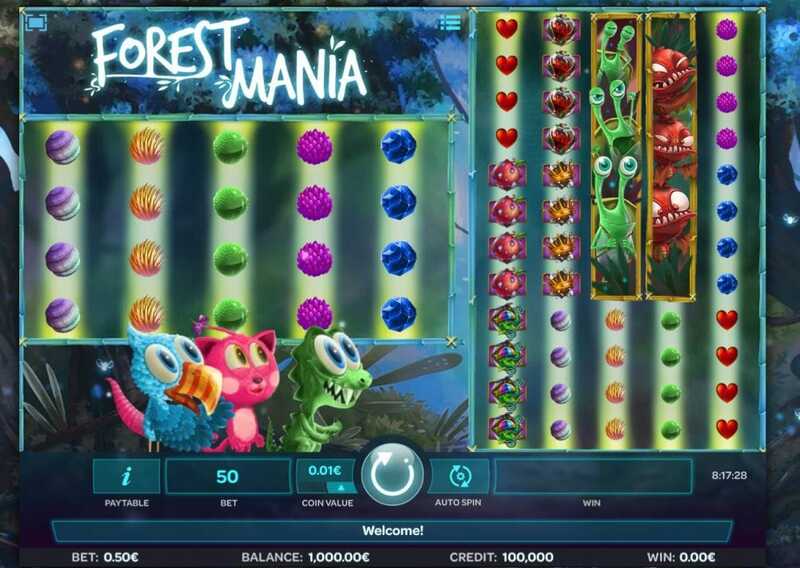 Created by iSoftBet, many avid casino players can assure you that Forest Mania is a game that you will find yourself returning to time and time again. Check out our entire list of Online Slot Games now. Yes, many casino game players have heard of big developers that were born in raised in the UK and the USA, but not many of them have heard of one that came from Australia like iSoftBet. Don't let their age fool you; iSoftBet is very well adapted to the new tech gadgets that are being invented and used every day. So, you can rest assured that all of their games can be accessed and played on many kinds of devices, like laptops, smartphones, and tablets. Throughout their 20 years of developing and publishing fantastic casino products that have helped them etch a place in the list of top casino game developers in history, they continue to follow their original mission of enhancing their gameplay. Not to mention making their fans return to playing their games consistently. They don't include the word 'Mania' in Forest Mania without a reason. Woodland areas are big and vast which can sometimes startle any wanderer, and that sensation is brought into this slot game where you don't just have a 5x4 reel, but also a 5x12 reel that fits onto your screen. However, there is nothing for you to fear, as the gameplay is very simple to comprehend with all of the symbol values shown at the bottom of the gameboard. Therefore, you won't feel frustrated or worried that you won't know what to do with the 2 reel sets. The furry little creatures are there to make you feel at ease, as well as make you feel amazing with all of the winnings you can make with the blue parrots and crazy cats that can help you reach the jackpot you're looking for. Blue Parrot WILD: Selects 1 symbol on the reels which it replaces and boosts your chances of making extra winnings. Crazy Cat WILD: Selects 3 reels and acts as a stack of WILDS that can raise your winnings even further. There are no SCATTER symbols in Forest Mania, but there is the BONUS FEATURE of a free spin that you could win thanks to Mr. Krokko popping up on your reels. Mr Krokko FREE SPIN: See Mr. Krokko on your reels, and you get up to 10 free spins. What could there be for you to fear about this game when all of the adorable forest creatures only appear to help you make big winnings? 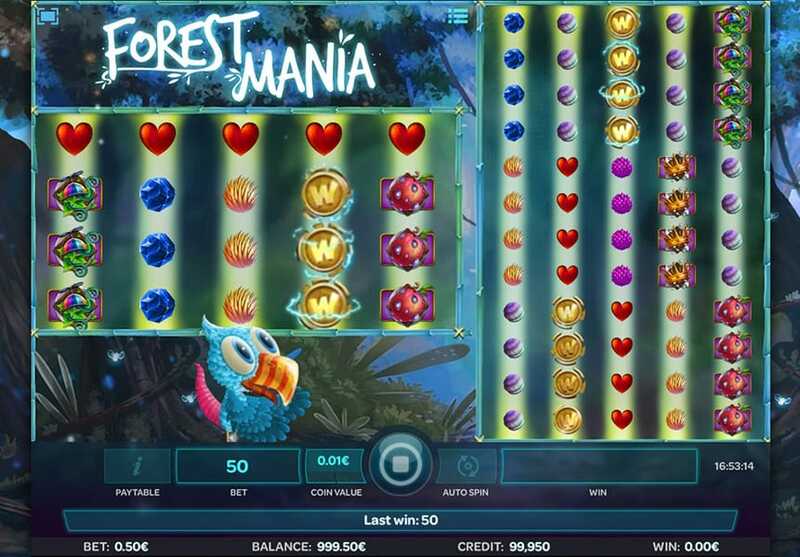 For many casino game players that are not familiar with Forest Mania, it can seem daunting to watch 2 reels spin on their screens. However, with the simple layout that iSoftBet has achieved in this game, the players are able to see the benefit of having those 2 reels, especially when it means that they could win more than what they have expected! Furthermore, the cute little forest critters are there to guide you through the game and help you reach the jackpot you desire without feeling lost in the woods, or feeling lost in the game!